As consumer electronics and video entertainment industry analysts are preparing to descend upon Las Vegas once again, to attend the International CES next week, perhaps now is the perfect time to consider the outlook for the evolving pay-TV sector. Infonetics Research has released excerpts from its latest global market study and associated report, which tracks pay-TV subscribers and video equipment sold to telco IPTV, cable and satellite television service providers. "Pay-TV providers are sweating their existing encoding assets as they wait for the next generation of platforms that support HEVC (high efficiency video coding) so they can reduce current bandwidth requirements while preparing for ultra-definition TV, such as 4K," said Jeff Heynen, principal analyst for broadband access and pay-TV at Infonetics Research. According to the Infonetics global market assessment, demand for contribution encoders among broadcasters will remain steady through 2017, with increases in spending due to the long-term transition to support HEVC and newer high-definition video formats. Infonetics expects the global broadcast and streaming video equipment market to decline about 9 percent in 2013 to $1.39 billion, then it will grow throughout the forecast period up to 2017. Content delivery network (CDN) edge servers, which serve as streaming video pumps for over-the-top (OTT) and unicast content, are forecast by Infonetics to grow at a 21 percent CAGR from 2012 to 2017. 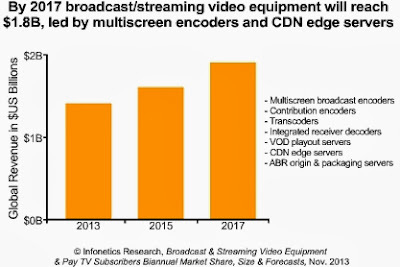 Spending on video-on-demand (VOD) playout servers is expected to decline in the short term, though pay-TV providers will continue to use them while shifting spending to CDN edge servers to support multiscreen and OTT video content. Multiscreen broadcast encoder revenue is anticipated to increase slightly over the next 4 years as operators transition to software-only platforms and encoders with integrated transcoding.